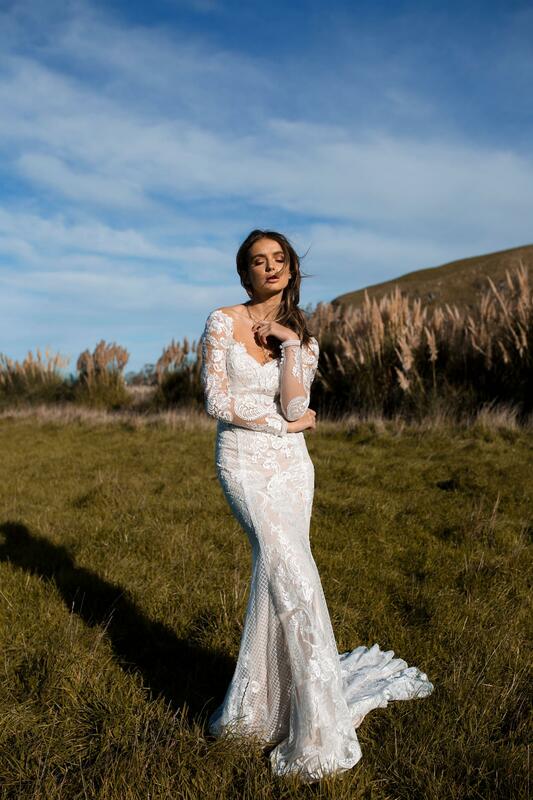 Adorned from the very edge of her shoulders to her extended hem in flocked lace, RENATA is a collection headliner and total showstopper for Madi Lane Bridal. Her intelligent design marks the evolution of the label and expertly combines romantic lace detailing with geometric silhouette-defining grid work. Long in sleeve and fitted through the body, the elegantly lengthening effect of RENATA is not lost on her bride and further enhanced by the addition of a V neckline that exposes much of the décolletage and invites an equally exquisite drop earring.